The abundant amount suds this shampoo gives you makes this the favorite shampoo of many detailing enthusiasts. 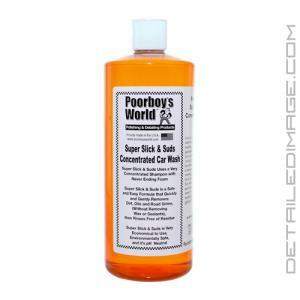 1 - 2 ounces of the Poorboy's World Super Slick and Suds will leave you with suds overflowing from your bucket. It safely breaks up contaminates and helps glide them off surface for maximum results. This quality shampoo is a great value that you'll be using for many details. Use on a cool surface. Rinse vehicle with water to remove heavy mud or grime. For washing an individual vehicle, place approximately 1oz of Super Slick & Suds into a bucket with every 2 gallons of water. Using a soft washing mitt, place it into the bucket & thoroughly soak the mitt. Wash in a back and forth motion, to prevent surface marring or swirl marks. Do one section at a time, and then rinse well, until the vehicle is fully clean, Remember to rinse the mitt after each panel in a separate clean bucket of water. For commercial use and multi-vehicle washings, we recommend using 2oz per 5 gallons of water. 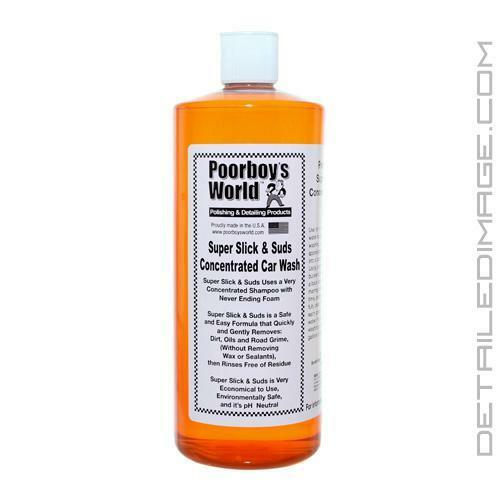 So I have 2 32 oz bottles of PoorBoys Slick Shampoo. I use this in my IK foamer and its a great car wash to work with. SS&S has been my go to wash for the last few months. The lubricity is terrific and the cleaning ability is unmatched. However, recently I have been noticing the soap seems to break down my favorite summer liquid waxes. I have been following the directions with 2-2.5oz per five gallon bucket but I would recommend 1-1.5oz. Less is more with this soap. Used properly, you won't regret this purchase.